Let us now praise famous soups. The hearty potatoes, the classic tomatoes (perfect with grilled cheese), even the Hungry Man soup with those little burgers (remember them?). A good soup can do so many things. It can slake hunger and chase off a chill. Grandma's chicken soup reportedly can cure your cold. So what is Memphis ladling out? We took to social media and asked for suggestions. What follows is our report. Ladies and gentlemen, soup's on! I can't speak to the relative sanity of the noodles, but Crazy Noodle, the little Korean diner next to the Kwik Chek on Madison, is almost always crazy busy. It's a cozy establishment, made more so when the few tables are all full. Being something of a regular at the Noodle, I knew what to expect: There are usually only two cooks and one server working (that's really all space allows for), and so my friend and I settled in for a wait. There are other dishes on the menu, but we were there for the ramen. My friend ordered the vegetable Mandu Ramen ($8.99), and I got the Chicken Ramen ($8.99). (I had been eyeing the mandu, but she beat me to it.) 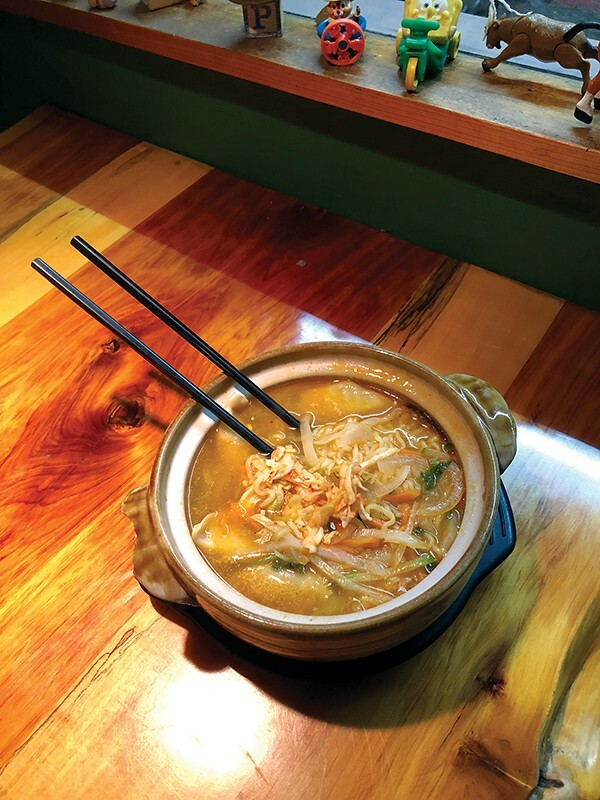 The Mandu Ramen is made with carrots, onions, green onions, shiitake mushrooms, cabbage, zucchini, turnip kimchi, and mandu (Korean dumplings), which can be had with vegetable or beef filling. I've eaten both, and they're delicious whether served herbivore- or carnivore-style. The Chicken Ramen includes many of the same ingredients, with the obvious addition of chicken instead of mandu, and with bean sprouts taking the place of the shiitake mushrooms. While the mandu is a little on the mild side, the Chicken Ramen is served in a spicy broth that fogged up my glasses and pairs well, to my tastes, with the onions and turnip kimchi. The cooks at Crazy Noodle don't skimp on the vegetables, so eating their ramen feels a little like eating a veggie-noodle salad with a spicy broth, making it a great choice for a cold night. My advice? Order a local beer to smooth out the spice, and go with someone whose company you enjoy. These noodles are worth the wait. My friend Victoria turned me on to the White Bean & Kale soup at Ciao Bella. She organizes a yearly get-together at the restaurant that included our much-missed colleague Leonard Gill. So for me, the soup translates into something dear: good gossip, better friends, and the fondest memories. And the soup is pretty darn good, too. Delicious, in fact. It's the last point that Blandy Lawrence will defend to the death. She is a super-fan of the Tuscan white bean & kale. Words like "perfect" and "fantastic" bounce among other superlatives. "I've been eating it for a long time," she says. 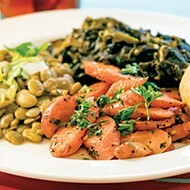 The soup is tender white beans with kale and a scattering of peppers, served in a light broth. 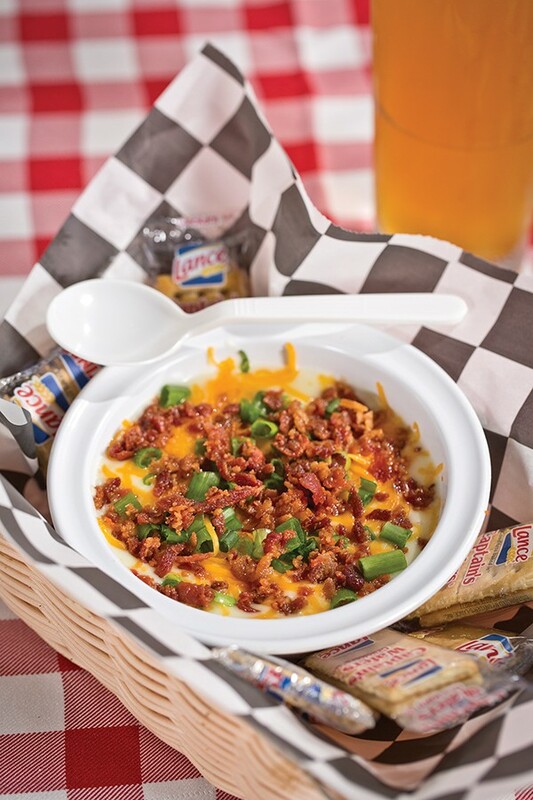 It serves as a light meal that fills you but doesn't run you over like a Mack truck. It's this last fact that Lawrence particularly appreciates about the dish. "The reason I like it is because it's light, tasty, and I feel like it's healthy," she says. The homely potato is the working stiff of foodstuffs, basic and dependable, as strange a fit to the idea of cuisine as a pea coat, say, is to that of couture. Yet it is a core item in most of the Western world's table fare, a root vegetable in every sense of the term, and is uncommonly satisfying as a source of energy, especially in the cold weather months that are now upon us, when few edibles are as quick a fix — especially in the hearty and instantly satisfying form of potato soup. If you name a dish after a globally beloved folk tale, it had better be good, right? 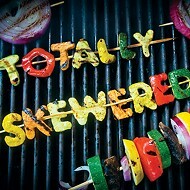 If you then name your restaurant after that dish, it had be better be good, right? So, the Stone Soup at Stone Soup had better be good, right? The Cooper-Young restaurant's eponymous Stone Soup might as well be the restaurant in a bowl. They — the restaurant and the dish — are cozy, comforting, and humbly high-quality. How can high-quality be humble? 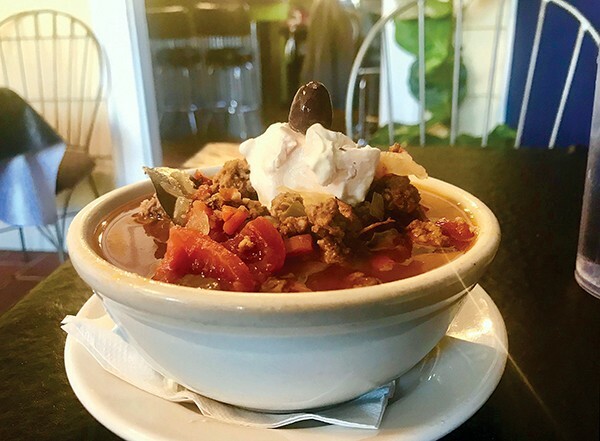 Eschewing the esoteric vernacular of many a trendy menu, Stone Soup says the smoked sausage in its Stone Soup is "country pleasin'." And it is, too, by god. I wasn't quite sure what I'd get when I ordered a bowl of Stone Soup last week. The menu said it had local ground beef, that "country pleasin'" sausage, and was topped with sour cream and black olives. It arrived steaming, heaped high in a generous bowl that said, "son, this soup is a meal." Meatballs swam in a tomato base, joining that country pleasin' sausage, of course, tomatoes, carrots, peppers, red kidney beans, and onions. After I took some bad photographs at the table (yep, being "that" guy — but it was for work! ), I mixed in the sour cream and olives. I took a bite and was transported. John Denver and I were huddled around the fireplace, sipping hot chocolate under old, soft quilts while snow gently blanketed the West Virginia hills outside the cabin John built with his own two hands. In short, Stone Soup's Stone Soup is everything that's right with winter. On the appetizer menu — before you get to the shawarma, falafel, and kebab sandwiches and entrees that represent Casablanca's staples — are a pair of soups that diners swear by. The Moroccan soup is a tomato-based concoction that is both hearty and vegetarian. Chickpeas and black lentils provide protein. Light pasta floats in the broth to provide a little added heft and a carbohydrate boost. Celery, onions, cilantro, and some secret spices round out the flavor profile. It's a comforting, healthy soup for a chilly day. "It's from Morocco, because my wife is from Casablanca," says Saed, the restaurant's co-owner, who says the name of the establishment also comes from her fabled hometown. 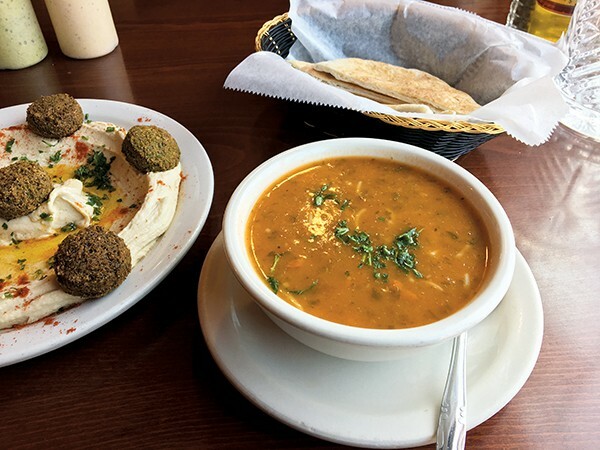 The simpler lentil soup, which combine the nutritious legumes with carrots, onions, and garlic, is another traditional Middle Eastern dish with a big following among Casablanca regulars. Preparing the soups is the first priority for the staff. "To cook this every morning is three hours" Saed says. "People like it a lot. We make a big pot every morning. Especially now, in the winter when it is cold." Glenn and Martha Hayes opened the cozy Midtown bistro Cafe 1912 in 2002. 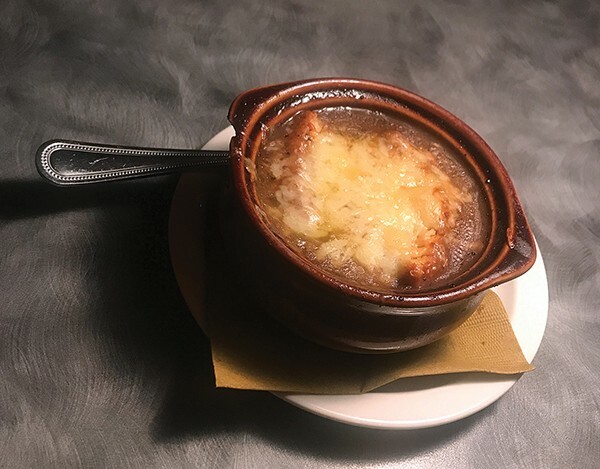 From its very beginning, one of the restaurant's staples has been its signature French onion soup, and there are few more comforting dishes in town on a chilly night. It's a rich and savory delight. Glenn Hayes says their version takes a while to make. "You need to cook very thinly sliced onions in butter and oil, until they're nice and brown, being careful not to burn them. It's constant stirring for up to an hour. From there, it's a matter of adding a high-quality stock. 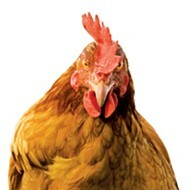 We use chicken stock, mostly, though some people use beef stock." Hayes then adds a sweet Port wine, salt and pepper, and a little thyme, and lets it simmer "for a long time." Hayes says he can't tell us the exact ingredient proportions because it's a "matter of taste." "Of course, the topping is what makes it classic French onion soup," he says. 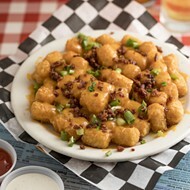 "You add croutons of toasted bread and top with melted gruyere cheese. Then use your spoon to drown them in the soup and you're in business. The "she" in the she-crab soup at Southern Social should stand for "sherry." 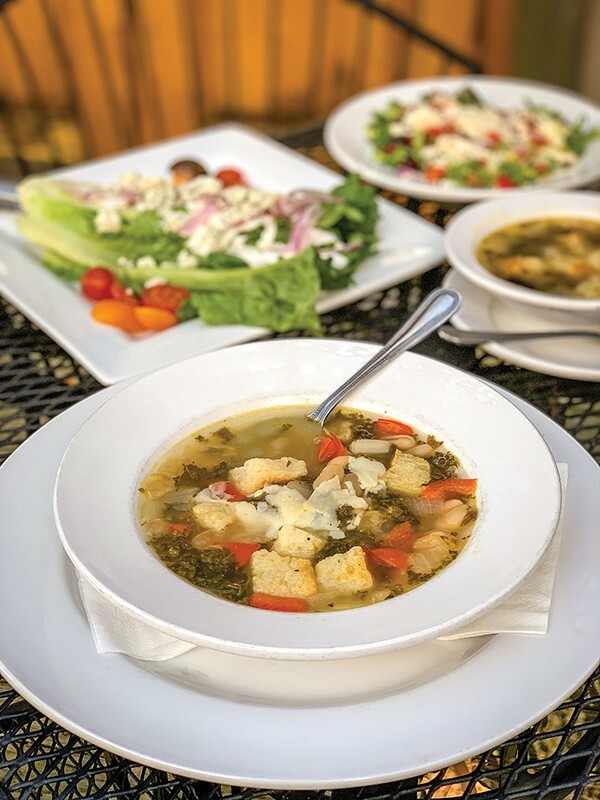 That ingredient is outstanding in the Germantown restaurant's popular soup. The soup also includes celery, onion, garlic, butter, tabasco, flour, crab stock, heavy cream, crab roe, salt, and white pepper. After my soup was served to me the other night at the bar, I heard someone say, "Look what you started." Julie Beda and Sharon Donovan, who were sitting near me, suddenly had cups of the soup in front of them. "It looked so good," Beda said. 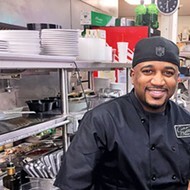 I asked owner Russ Graham how they came up with their she-soup, which is not the same she-crab soup recipe served at his other restaurant, Flight Restaurant and Wine Bar. 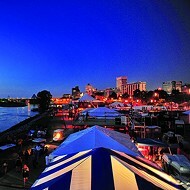 He says he and co-owner Tom Powers spent some time in Charleston, South Carolina. "We really enjoyed talking about the differences between she crab soups at restaurants," Graham says. They finally decided on a recipe "that worked for us. 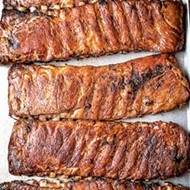 We had a basic recipe and tweaked it." That was two years ago last November. "I think it was embraced fairly quickly," he says. Their executive chef, Mario Torres "believes in the soup," he says. That's "what makes the soup great." Torres, who did the tweaking, says, "The secret of the flavor is from the stock." He makes the stock in the "old French cuisine" style. They reduce the stock to 50 percent. "It concentrates the flavor of the crab." And, he says, "We reduce the sherry wine to opaque. And that enhances the flavor of the sherry as well." Torres isn't the only one who believes in the soup. Managing partner Joe Fain is also a big fan. "I've had a cup every day since we've opened," he says. Even before the first spoonful is sipped, the taste buds know something great lies ahead, as a tomato-y aroma arises from the bowl and fills the nose. Rich in color and in taste, La Baguette's Spicy Tomato Soup is the right combination of warm zest and spice — perfect for any cold day. 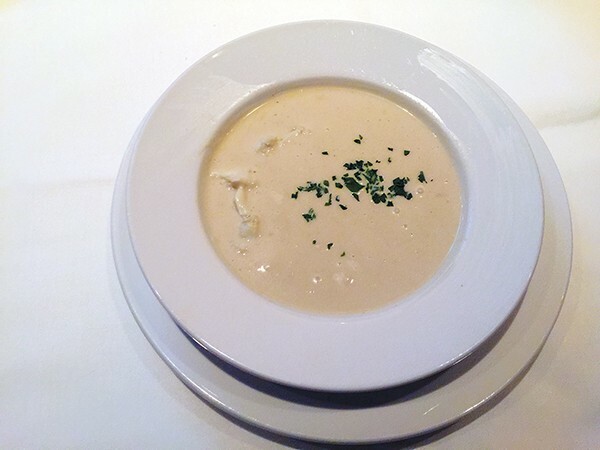 The soup is served with a melted dollop of Swiss-American cheese on top and because no bowl of soup is complete without bread, slices of freshly baked French bread on the side. Both work in tandem to cool the spices of the dish. 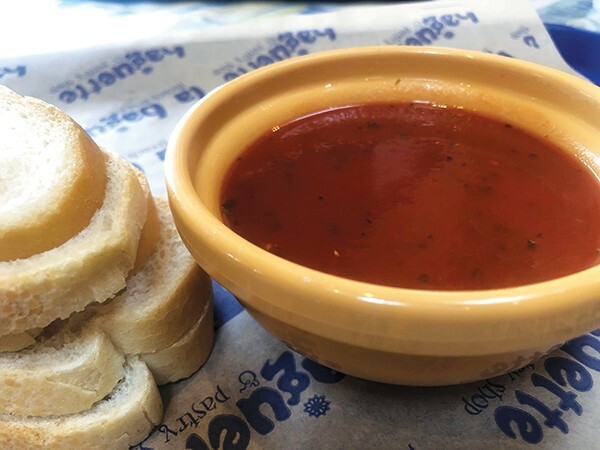 Not like your everyday tomato soup, La Baguette's version is more like the homemade kind your mom used to make. It's full of Italian seasonings with hints of basil and oregano in every bite. Tangy sweetness from the tomatoes perfectly balances with the savory spices. Gene Amagliani, owner of La Baguette, says the tomato soup is a fan favorite that "people often rave about." It's all in the secret recipe, Amagliani says. It cooks for hours, Amagliani says, allowing the company's "secret spices that make the soup so delicious" to kick in. "We pride ourselves on our spicy tomato soup," Amagliani says. 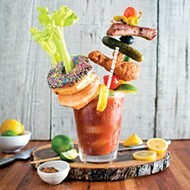 "I can't reveal much, but I'll tell you it has tomato and basil in it. It's been the same secret recipe since 1976, and it works." La Baguette's tomato soup is so good, it's one of the cafe's two soups that's offered every day. At the Asian Eatery, less than a tenner will get you a generous bowl of Tom Kha Kai. This takes the Thai classic in a novel, light direction. 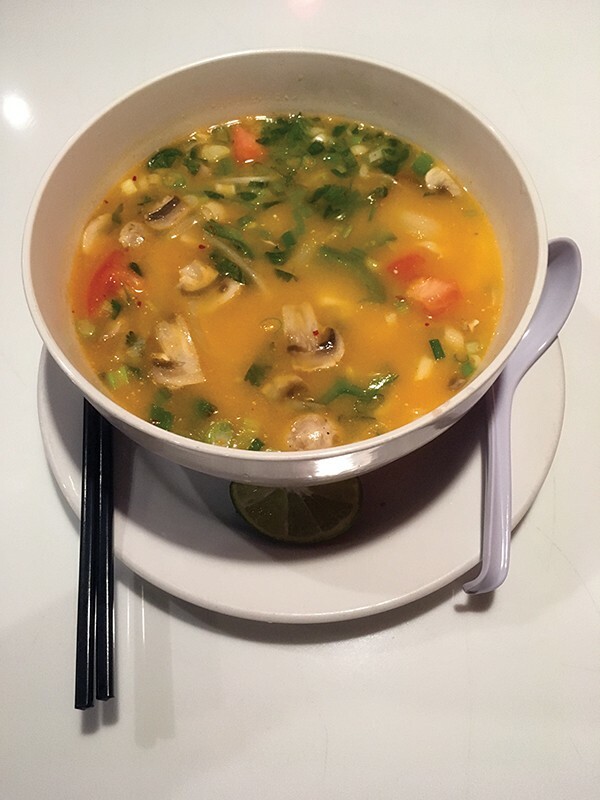 Often called Tom Kha Gai, the usual recipe for this soup involves coconut milk and chicken cooked with mushrooms, onions, scallions, bell peppers, chili, lime leaves, lemongrass, and galangal root. That last ingredient is key; that's the kha in the soup's name. Of course, one doesn't eat the galangal if there's a bit in your bowl. Instead, it permeates the broth. Naturally, the whole thing's garnished with fresh bean sprouts and cilantro. But at the Asian Eatery, one final ingredient — tomato — sets this version apart. The subtle addition of the nightshade adds a bit of edge to the coconut milk's creaminess. If you find Tom Kha Gai to be the ultimate Southeast Asian comfort food, and many do, this trace of tomato will make it even more homey and familiar to you. It certainly doesn't try to be a creamy tomato soup. Rather, by merely hinting at that, a new dimension to the classic dish opens up, as the fragrant, tart-yet-sweet tomato brightens the more conventional richness of the coconut milk. Across cultures, whether you grew up Jewish, Thai, Greek, or Cajun, simple, broth-based chicken soups are revered for their ability to heal, nourish, and delight the senses. Few are simpler or more satisfying than the chicken and chipotle soup served at Maciel's Tacos & Tortas, a locally owned Mexican food chain with locations Downtown and near the U of M. It's light enough to eat in the summertime, but this soup's a core-warming, mouth-tingling comfort when temperatures plunge and the world turns icy and gray. 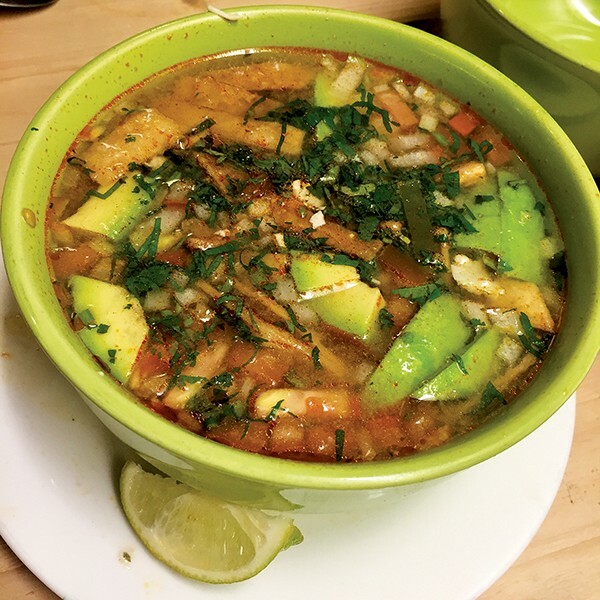 Maciel's chicken soup is similar to a standard tortilla soup, but with a tangy, smokey twist. It starts with a rich chicken broth lightly sweetened and thickened by corn masa from fried tortilla strips and stained dark orange by the presence of an adobo-packed chipotle or two. Rice adds heartiness, and the chicken chunks are small and plentiful. There was a time when smoked jalapeño peppers — chipotles — were a curious and exotic delicacy appearing only on the most adventurous menus. Today, they make regular appearances at fast food restaurants, including one named for the chili. 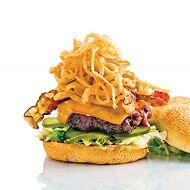 They're so normalized it's easy to forget just what a flavor star they can be if you give them a little room to shine. Just a small amount brings heat, smoke, color, and an almost citrusy zip. Maciel's chicken soup is a perfectly balanced example: picant but never aggressively so.